Ha! I told you all this was coming! It's so nice being right about these things. In fact, it happened even quicker than I thought! If you'd like to see what I'm talking about, first go to this blog post and read my comment #7 in the comments section at the bottom. Then read this news story. A nice way of putting it is bait-and-switch. Or vote-and-switch. Internet Explorer 8 (IE8) Officially Released! The official release day of Microsoft Internet Explorer 8 (IE8) is here, and as predicted, it took place this month (March). The timing actually coincides with the big annual Microsoft developer's conference called MIX 09. I have been using IE8 for many months now, so I have had an opportunity to watch the product evolve and continue getting better. I highly recommend that any user of Windows XP or Windows Vista install it without reservation. Lottery Post has been thoroughly tested and tweaked to be sure it works perfectly with IE8, and I can say from my own experience that the new browser works very well with practically every site on the Internet. What makes it so wonderfully compatible is the little Compatibility Button that sits right at the top of the browser. Any time you want, you can click that lite button and the browser will change modes to render the site in IE7 mode — for just that one site. You can even set any site to permanently render as IE7 without having to click the button. That kind of precise control is just plain awesome, and totally removes any need for worrying about upgrading. It is the ultimate fall-back plan, without having to uninstall the product. The following news story was posted today at Politico, a non-partisan (some say left-leaning) news organization that deals exclusively with politics. For a long time it has been fairly easy to see the connections within the mainstream media: a story published by the hard-left New York Times in the morning is the blueprint for the news stories of the day in the rest of the media, whether in print, broadcast, or online. Now we know the mechanism that makes it happen. This is how stories were concocted to sink the excellent Sarah Palin, and this is how the media is kept "on-message" when reporting about Obama. This is exactly what the mainstream media is NOT supposed to do. It is the antithesis of objective reporting. It is collusion and corruption, and it will continue the elevation of one party, while destroying the other. And that is not good for anyone, no matter how delusional and hypnotized they are. Not at all, says Ezra Klein, the 24-year-old American Prospect blogging wunderkind who formed JournoList in February 2007. "Basically," he says, "it's just a list where journalists and policy wonks can discuss issues freely." But some of the journalists who participate in the online discussion say — off the record, of course — that it has been a great help in their work. On the record, The New Yorker's Jeffrey Toobin acknowledged that a Talk of the Town piece — he won't say which one — got its start in part via a conversation on JournoList. And JLister Eric Alterman, The Nation writer and CUNY professor, said he's seen discussions that start on the list seep into the world beyond. "I'm very lazy about writing when I'm not getting paid," Alterman said. "So if I take the trouble to write something in any detail on the list, I tend to cannibalize it. It doesn't surprise me when I see things on the list on people's blogs." Last April, criticism of ABC's handling of a Democratic presidential debate took shape on JList before morphing into an open letter to the network, signed by more than 40 journalists and academics — many of whom are JList members. But beyond these specific examples, it's hard to trace JList's influence in the media, because so few JListers are willing to talk on the record about it. POLITICO contacted nearly three dozen current JList members for this story. The majority either declined to comment or didn't respond to interview requests — and then returned to JList to post items on why they wouldn't be talking to POLITICO about what goes on there. In an e-mail, Klein said he understands that the JList's off-the-record rule "makes it seems secretive." But he insisted that JList discussions have to be off the record in order to "ensure that folks feel safe giving off-the-cuff analysis and instant reactions." A LexisNexis search for JournoList reveals exactly nothing. Slate's Mickey Kaus, a nonmember, may be the only professional writer to have referred to it "in print" more than once — albeit dismissively, as the "Klein Klub." While members may talk freely about JList at, say, a Columbia Heights house party, there's a "Fight Club"-style code of silence when it comes to discussing it for publication. "No one's pushing an agenda," said Toobin. Toobin joined JList about a year ago, and he said that he had to get a new e-mail address just for JList in order to keep up with the sheer volume of commentary that appears there every day. The frequent disputes among members, he said, are "what's most entertaining on the list." John Judis, a senior editor at The New Republic, described JList in an e-mail as "a virtual coffeehouse" where participants get a chance to talk and argue. "There is probably general agreement on the stupidity of today's GOP," he said. "But beyond that, I would say there is wide disagreement on trade, Israel, how exactly we got into this recession/depression and how to get out of it, the brilliance of various punk bands that I have never heard of, and on whether, at any given moment, the Obama administration is doing the right thing." But aren't there enough forums for arguing about domestic and foreign policy - or even for partaking in the more idiosyncratic JList debates about the merits of Bruce Springsteen and whether The New Republic is liberal enough? And do those debates really have to happen behind a veil of secrecy? "It's sort of a chance to float ideas and kind of toss them around, back and forth, and determine if they have any value," said New Republic associate editor Eve Fairbanks, "and get people's input on them before you put them on a blog." Yglesias, who writes an eponymous blog hosted by the Center for American Progress, noted that "the combined membership has tentacles of knowledge that reach everywhere," adding that "you can toss out a question about Japan or whatever and get some different points of view." Alterman said it's important that there are "people with genuine expertise" on the list. "For me, it's enormously useful because I don't like to spend my time reading blogs and reading up-to-the-minute political minutia," he said. "This list allows me to make sure I'm not missing anything important." POLITICO's Mike Allen, Ben Smith and Lisa Lerer are on the list. "The roster includes some of the savviest authorities on everything from behavioral economics to Ben's Chili Bowl," Allen said. "It's a window into a world of passionate experts — an hourly graduate education." Said another JLister: "I don't know any other place where working journalists, policy wonks and academics who write about current politics and political history routinely communicate with one another." That's been the subject of some JList conversation, too, as members discuss the Weekly Standard's publication of a 2006 e-mail posted to the private China Security Listserv by diplomat Charles Freeman, who last week withdrew his name from consideration for a top intelligence job. Michael Goldfarb, a former McCain staffer and conservative blogger who published the e-mail, was not part of the China list and therefore hadn't agreed to any off-the-record rules. Asked about the existence of conservative listservs, Goldfarb said they're much less prevalent. "There is nothing comparable on the right. E-mail conversations among bloggers, journalists and experts on our side tend to be ad hoc," Goldfarb said. "The JournoList thing always struck me as a little creepy." Kaus, too, has seemed put off by the whole idea, once talking on BloggingHeads about how the list "seems contrary to the spirit of the Web." "You don't want to create a whole separate, like, private blog that only the elite bloggers can go into, and then what you present to the public is sort of the propaganda you've decided to go public with," Kaus argued. But Time's Joe Klein, who acknowledged being on JList and several other listservs, said in an e-mail that "they're valuable in the way that candid conversations with colleagues and experts always are." Defending the off-the-record rule, Klein said that "candor is essential and can only be guaranteed by keeping these conversations private." And then Klein — speaking like the JLister he is — said there wasn't "anything more that I can or want to say about the subject." Webmasters can be obsessive about Web browser statistics, such as what browser people are using, what version number, etc. Another statistic that can be an important "tell" is what operating system people are using, because it telegraphs a lot of information about your visitors' computers and capabilities. For example, someone using Windows 98 is going to have an old, very underpowered PC, whereas someone using Windows Vista will tend to have a more modern, capable computer. That information is important to me because it tells me how far I can go with delivering leading-edge features. If only 5% of the people visiting the site is capable of using a feature, I won't waste my time on it. But if 60% of visitors can use something, I give it more attention. If 90% of the visitors can use something, most of my effort goes there. So one of the stats I watch closely is the ratio of Windows XP users to Windows Vista users, because the more Vista users there are, the more leading-edge features I feel comfortable spending the time creating. For a long time, the number of Vista users remained pretty steady at only about 25% of the number of XP users. So if there were 1,000 Windows XP users visiting Lottery Post at a certain point, I could pretty accurately predict that at that moment there were also about 250 Windows Vista users on the site. The statistics continued bearing out that ratio for a long time. But recently, I have noticed a sharp uptick in the number of Vista users on the site — a very encouraging statistic. That ratio of XP-to-Vista users is now up to about 50%. At this moment (at this time I'm writing this) there are 1,113 Windows XP visitors and 582 Windows Vista visitors — which equates to 52%. That's nice to see! I'm not sure as to the timing of why that is happening now. Maybe it's the upcoming release of Windows 7, or computer companies having big sales, or something else. But I do know that it helps bring me closer to getting my hands unshackled as far as being able to build much more slick, friendly features. On the other hand, one statistic that is still too high, and I'd like it to drop like a stone, is the number of IE6 users. IE6 continues to be the bane of my existence. It is so full of security holes and is so incredibly buggy that I am constantly holding back on delivering exciting things because there are still too many IE6 users to completely drop support for it. Every single IE6 user has a PC that is capable of running Firefox. Their entire web browsing experience would be 20-thousand times better using Firefox than it is with IE6, and it doesn't cost a penny to upgrade. I wish there was a way I could reach across the Internet and click download for them. Anyway, I mentioned Windows 7 earlier, and I'll be doing a write-up on it sometime in the future. Suffice to say in the meantime that it is just plain awesome. In fact, I'm using the latest build of Windows 7 (build 7057) right now as I write this. Everything is just so refined and ... logical. And it's fast too — faster than both Vista and XP in all the tests I've seen. That's been my experience as well. Good quality film of Wright Brother's "Flying Machine"
I have personally never seen such great quality film of the Wright Brothers' invention, as can be found in the video linked below. Typically the only thing shown on TV programs are quick, extremely grainy clips, and you can barely see what you're looking at. The video linked below shows a good-quality film of several minutes in length that gives you a good look at their "Flying Machine" (not called an "airplane" or "aeroplane" yet). What is even more fantastic is there was an on-board camera on the Wright plane and the last part of this film shows it. Wilbur Wright is at the controls on both of the flights. Enjoy an important piece of history! As a result I get a good deal of experience with just about every type of computer accessory and part, and also get a sense for the fragile parts or parts that tend to get designed poorly by manufacturers. So I thought today I'd pass along a tip for anyone who is involved with replacing their hard drive, or simply wants to make their computer interior a little cleaner and safer. 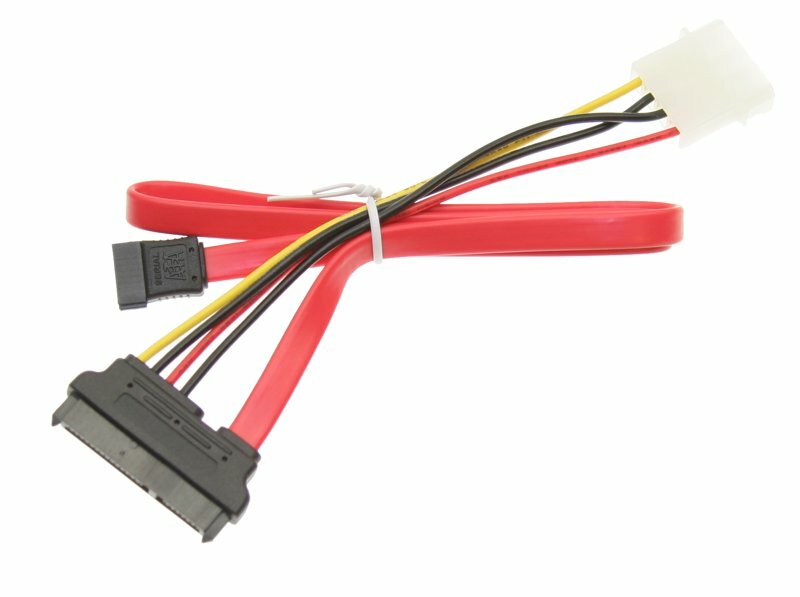 My tip is for a hard drive cable — specifically for SATA hard drives (older hard drives use IDE connections, and they don't work with this cable, and in fact don't even need a cable of this type). However, a hard drive also needs a power cable attached, and most off-the-shelf computers simply use a second 4-wire power cable, so each drive in the computer has a total of two cables attached to it. With this cable, the large connection fits over both the data and power ports on the drive, and the other ends plug into their respective data and power ports within the computer. First, it cleans up some of the clutter caused by lots of cables inside the case. At first, many people think, "What's the point?" when it comes to un-cluttering the interior of a PC, but there is actually some real benefit. It can dramatically cut down on heat by allowing better circulation (hence making the computer last longer), and it makes working inside the case much safer and less error-prone. It is very easy to accidentally plug the wrong plug when wires get tangled in a mess. Even though they are light-years better that IDE connectors, SATA connectors do have a couple flaws in their design. One such flaw is that it is easy for the cable to come unplugged because there is no built-in latching mechanism. By combining the data with the power into one larger connector, it makes the connection sturdier and less apt to come unplugged. A connector like this will also leave the main power cables from the power supply farther away from the drives, which in my book is a good thing. I find power supply cables to be unwieldy in most instances, and I like to keep them coiled near the power supply, if possible. However, there is still a problem with the combination data/power cable pictured above, and there is only one cable I've found that solves the issue. The problem is a second basic flaw of SATA connectors: they break easily. Fortunately I've never had one break myself, but I've been close. I've heard many stories of hard drives being ruined by a simple broken connector. If you look at the combination cable above, you'll notice that as the data and power cables exit from the drive (the large connector), they come straight out from the connector. Having both data and power cables coming straight out actually creates a leverage point, with the drive connector itself being the weak point. If those cables get forced up or down too hard, it can be easy to break the drive connector. Inside many computer cases, there are either fans located behind the hard drives (for cooling) or else the drives can be in a cramped space, or perhaps the cables are barely long enough and need to be bent pretty hard in order to stretch all the way to the SATA ports. In any of these situations, the straight-out cable configuration can be potentially dangerous for the hard drive connectors, and it will definiitely stress the connectors over time. I have finally located a SATA cable that fixes all of the above problems, which is why I was compelled to write this tip. You can have all the benefits of a combination cable, without the risk that your drive connectors will snap off. I have no idea why these cables are not sold everywhere, because they make so much sense. I find them so valuable that I always order more than I need, so that I'll have extras around when I need them. And did I mention that they're cheap? I fully expected a niche item like this to cost $15 a piece, but surprisingly they are currently offered for just $2.51 per cable! The subtle difference between this good cable and the one that risks your connectors is that it is set at an angle, with the cables exiting from the connector at a down-angle. See how the cables come off the drive in a downward angle? That takes all the stress off the cable, helping to ensure the connectors stay in one piece. 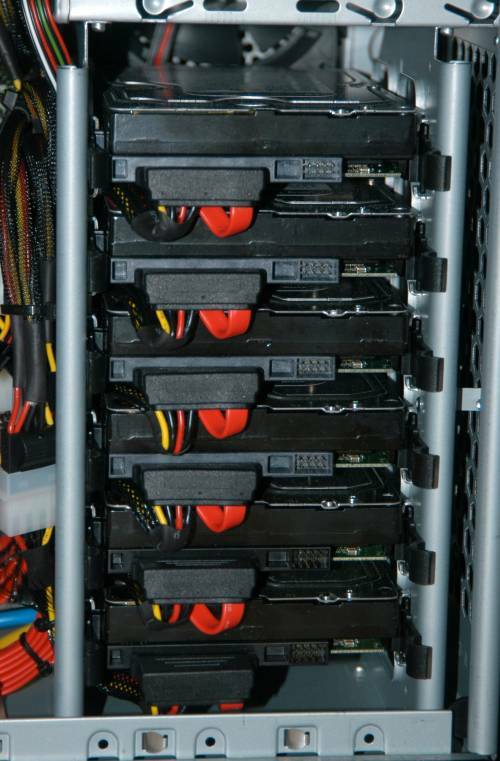 To show what a big difference these cables make, let me show you a 6-drive array that I built using these cables. The cables are completed protected from getting pulled or pushed accidentally. If I need to remove a drive I can do it without removing the rest of the drives (which would not be possible if all the cables were routed down the backs of the drives). So where can you get these cables? The only place I've found is at CoolDrives.com. Their Web site says that the price of $2.51 is a sale price, but it's been at that level for a long time, so I take it to be a regular price. 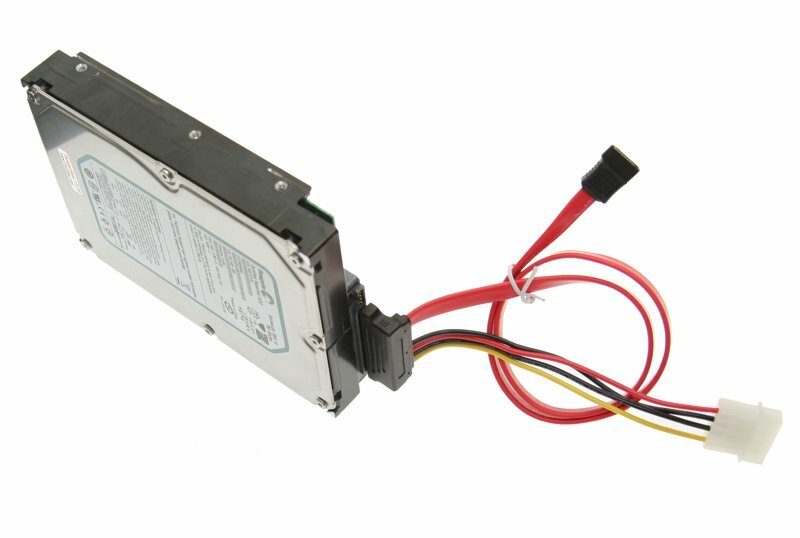 I don't recommend that someone who has never worked inside a computer case go rushing out to outfit their computer with new cables, but for someone who has done it a few times, this combination SATA data+power angled cable may be just the thing. this video is worth volumes.